for further information on how Amazing Norvil & Josephine could appear at your event to present something special that your corporate audience will be buzzing about for years to come. 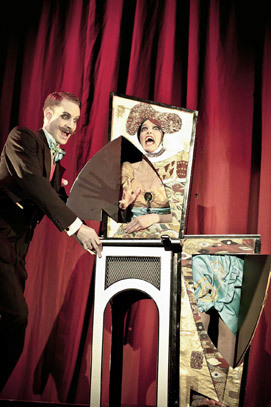 The distinctive magician duo Amazing Norvil & Josephine present their entertaining shows as UK corporate magicians. Their award winning and entertaining act has received critical acclaim and is perfect if you're looking for a stage magician show to dazzle at your UK event. This act is unique because, apart from incredible stage magic, they also add a touch of something special to the act with acrobatics and singing. This UK corporate magician show is also ideal because of its flexibility to draw from a wide repertoire and custom craft you a routine that will shine in your venue. What do we mean by 'UK Corporate Magicians'? - Understand they represent your company when you hire them! CONTACT US today to tell us about your event and get a quote. "I have had so many positive comments from my colleagues. The show was action-packed, lively, energetic and fun! Everyone thought the act was fabulous!" "The feedback from everyone I spoke with after the show was, to put it simply, awesome! Thank you so much, just brilliant!" "It's an act that's different from other UK magicians. We are very happy we found you!"